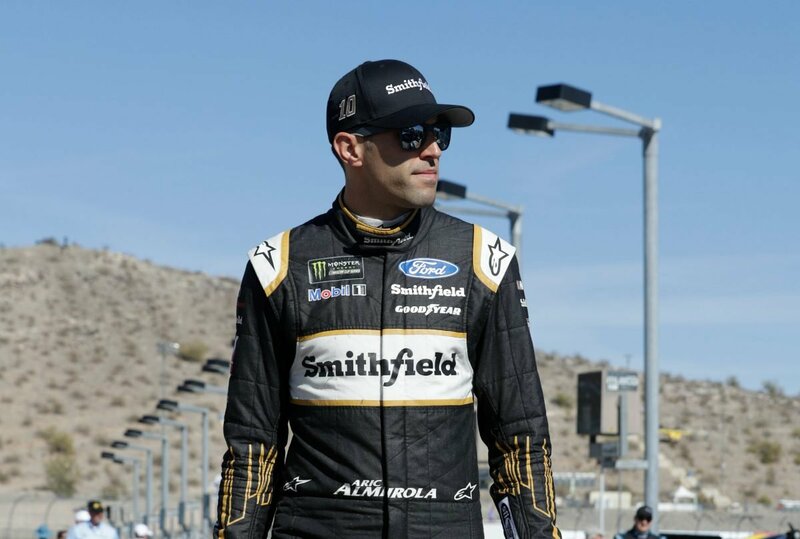 Almirola began Stage 1 in the 22nd position at ISM Raceway near Phoenix and ended it in the 13th spot. The scheduled competition caution came out on lap 25, and Almirola visited pit road for fuel, four tires and adjustments. On lap 51, the 33-year-old entered the top-15 in the Smithfield Ford and continued to move forward throughout the stage to capture the 13th position. All four of the Stewart-Haas Racing (SHR) entries completed Stage 1 in the top-13. Almirola began Stage 2 from the 13th spot and ended the stage 21st. Before the start of Stage 2, Almirola visited pit road for four fresh tires, fuel and adjustments to help tighten the entry on the No. 10 Ford. The Tampa, Florida, native made two pit stops during the second caution periods for fuel, four tires and adjustments to help with a loose-handling condition. After a one-lap shootout under green to finish the stage, Almirola ended up 21st. Almirola entered the final stage in the 16th position and completed it in seventh. The Smithfield Ford driver didn’t pit before the start of the final stage, a strategy most of the field followed. During the lap-190 caution, Almirola visited pit road and crew chief Johnny Klausmeier made the call for two right-side tires, fuel and adjustments, ultimately gaining multiple positions with the call. On lap 192, Almirola started from the second position. He was able to consistently stay in the top-10 until the checkered flag flew, and he brought the No. 10 Smithfield Ford Fusion home in seventh. This is the first time SHR has placed all four of its drivers in the top-10 in a single race. Almirola’s seventh-place finish was his best in 15 career Cup Series starts at Phoenix. His previous best was ninth, earned last year. This was Almirola’s second top-10 of 2018 and his third top-10 at Phoenix. Harvick’s victory in the TicketGuardian 500k marked the 46th overall win for SHR. It was the organization’s 42nd points-paying Cup Series win and its sixth at Phoenix. This was SHR’s third straight Cup Series victory. Harvick won last Sunday at Las Vegas Motor Speedway and Feb. 24 at Atlanta Motor Speedway. It was the first time Harvick has won three straight Cup Series races. This was SHR’s sixth Cup Series victory with Ford. The team won its first race with Ford when Kurt Busch captured the 2017 Daytona 500. There were six caution periods for a total of 36 laps. Only 15 of the 37 drivers in the TicketGuardian 500k finished on the lead lap. The next event on the Monster Energy NASCAR Cup Series schedule is the Auto Club 400 on Sunday, March 18 at Auto Club Speedway in Fontana, California. The race starts at 3:30 p.m. EDT with live coverage provided by FOX, MRN and SiriusXM radio Channel 90.